Crankworx without side events and parties would be a bit like schnitzel without the breadcrumb coating – good all the same, but somehow missing an essential ingredient. That’s why in 2018 visitors to Crankworx Innsbruck can once again look forward to a huge range of activities both during and after the sporting competitions to make sure that their Crankworx schnitzel tastes better than ever! Charge up your batteries and activate your energy reserves – there are just three weeks to go until the start of Crankworx Innsbruck! “Preparations for Crankworx Innsbruck are in full swing and we are looking forward to welcoming both locals and international guests alike to five spectacular events at Bikepark Innsbruck. We have also been working with local partners and associations to come up with a great range of side events and parties,” explains Georg Spazier, head of the organizing team behind Crankworx Innsbruck, innsbruck-tirol sports GmbH. Yoga on the shores of a mountain lake, a strength and release session powered by BASEFIVE, loads of contests like BunnyHop and Crazy Outfit as well as an Expo Area showcasing all the latest innovations from the world of mountain biking – Crankworx Innsbruck 2018 really offers something for everyone. For the first time, female riders can look forward to a number of ladies-only side events looking at all aspects of mountain bike riding and maintenance. Food trucks serving delicacies and cool drinks from around the world will be on hand to fill hungry mouths. For more information about the side events going on at Crankworx Innsbruck click HERE. Don’t forget, holders of a Festival Ticket can take part in all the side events at the venue free of charge. 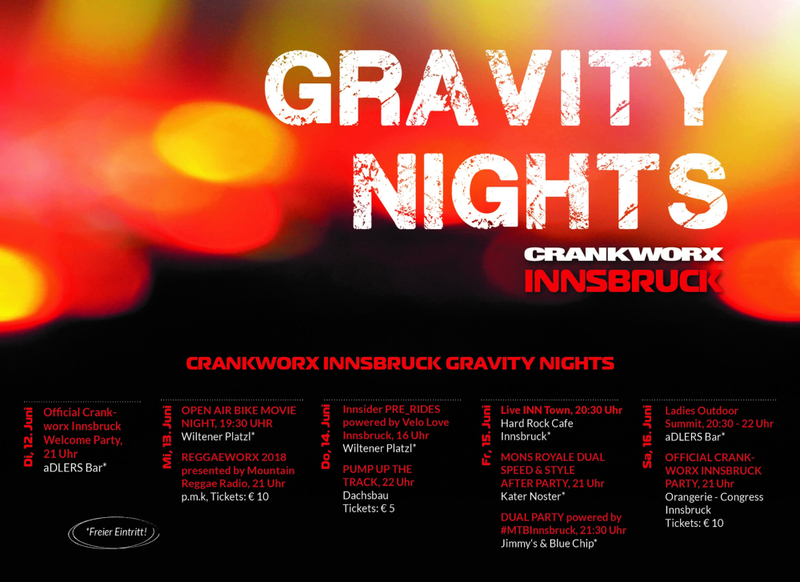 Held at selected locations, the Crankworx Innsbruck Gravity Nights are the place to be when the sun sets and Innsbruck comes to life. Highlights include an open-air cinema, bike rides, DJ sets and live gigs. For more details check out the full schedule. The countdown starts now! Join us in welcoming the world’s best mountain bikers to Innsbruck at the Official Crankworx Innsbruck Welcome Party at the bar of the aDLERS hotel, our Official Accommodation Partner. The event will start at 9:00pm on the rooftop terrace of this modern design hotel with fabulous views of the mountains. The perfect way to start an unforgettable week! Admission is free of charge and will be on a first come, first served basis. Following the spectacular OAKLEY Official Alpine Whip-Off Championships presented by SPANK it is time to kick back and enjoy the OPEN AIR BIKE MOVIE NIGHT on the Wiltener Platzl square in the heart of Innsbruck. Doors open at 7:30pm and the film will start at 9:00pm. On screen will be the premiere of the spectacular new film “North of Nightfall” (Red Bull Media House) and a best of Innsbruck local productions. Stoked, happy and relaxed, the party vibe continues at 10:00pm with REGGAEWORX 2018 presented by Mountain Reggae Radio in the city’s p.m.k club featuring top acts such as iLLBiLLY HiTEC ft. Longfingah / Kinetical (Live reggaetronics / Berlin) with local support from INnFaya Sound, Ironshirt Sound & United Movement. Admission on the door: €10. Activities on Thursday begin at 4:00pm with the Innsider PRE_RIDES powered by Velo Love Innsbruck, an adrenaline-pumping bike ride with local guides that is guaranteed to get your pulse racing. After the final of the RockShox Innsbruck Pump Track Challenge it is time to put on your dancing shoes and head to the Dachsbau club for PUMP UP THE TRACK. Tickets for this new school hip hop night FADED! with N-Otha & Gundada are available for €5 on the door. Friday night’s party schedule following the conclusion of the spectacular Mons Royale Dual Speed & Style Innsbruck offers not one, not two, but three separate events. From 8:30pm SON OF THE VELVET RAT will be playing at Live INN Town in the Hard Rock Cafe Innsbruck. Headed up by Austrian singer songwriter Georg Altziebler, this intimate gig in a cool location is the perfect way to get your Friday night started. From 9:00pm the Kater Noster bar will throw open its doors for the official MONS ROYALE DUAL SPEED & STYLE AFTER PARTY where cold drinks and hot electronic beats will be served into the night. Last but certainly not least, the party action concludes with the DUAL PARTY powered by #MTBInnsbruck in two of Innsbruck’s most legendary locations: Jimmy’s and Blue Chip. On the decks will be Dj Fu (Wax Wreckaz) & Dj Philipps (formerly of Weekender Club) laying down a mixture of hip hop and indie across two floors. With both parties offering free admission, we recommend checking out both. You won’t regret it! 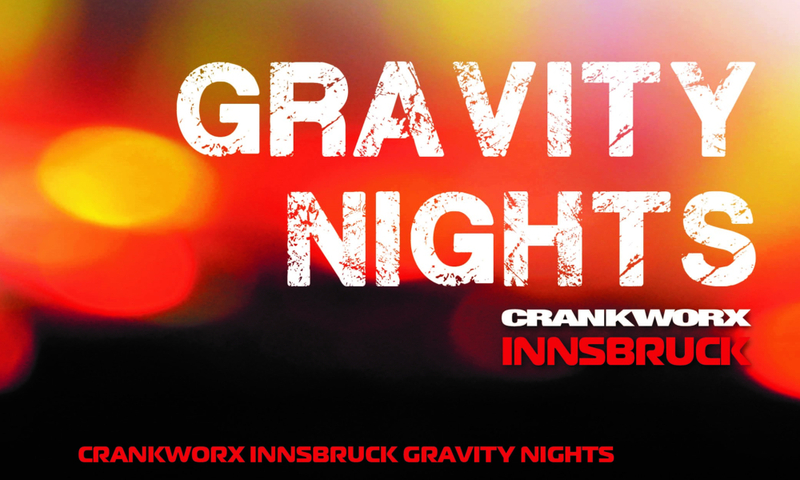 The Gravity Night on Saturday is set to be THE highlight on the Crankworx Innsbruck party schedule. It begins with the Ladies Outdoor Summit from 8:30 until 10:00pm at the aDLERS hotel. The event with the motto “Passion for Sport” will give successful female athletes (skate, bike, etc.) the chance to share their stories and experiences from the world of action sports. Admission is free. Participants can register online. Ladies only! Once the medals have been handed out at the Crankworx Innsbruck Slopestyle presented by Kenda and we know who is leading the race for the Crankworx FMBA Slopestyle World Championship, it is time for the OFFICIAL CRANKWORX INNSBRUCK PARTY. Hip hop & future beats are the name of the game with Dj D.B.H. (Total Chaos) & H∆NN∆ (0 800/Son au citron) flexing on the decks from 9:00pm in the Orangerie at Congress Innsbruck. Tickets for the party, including a special bike act, cost just €10 on the door. Don’t miss out on what is sure to be a sick night of party action. The iXS Innsbruck Downhill presented by Raiffeisen Club on Sunday brings an action-packed week of mountain bike competition to its spectacular conclusion. Top downhillers from around the world will go up against the best locals to see who comes out on top in the battle against the clock.